I recently came across a website that I have been very impressed with. So much, that I wanted to share with you. The site is called iCivics and is full of free games and resource packed lessons. Topics covered range from the writing of the Constitution to the 2012 election. 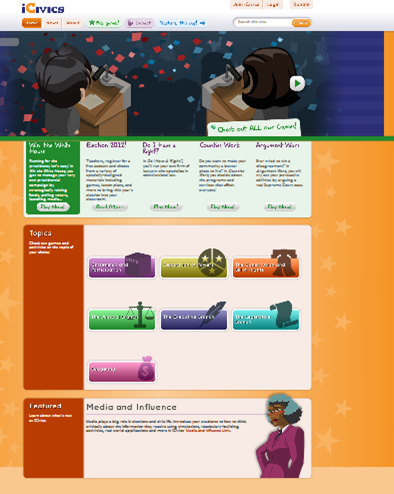 iCivics provides a scope and sequence for each topic. A curriculum finder is also included which allows you to find what standards are being addressed within each lesson. If you are looking for resources to support the upcoming election, simply sign-up for a free account and you have the choice of a three or five day election curriculum. Additional lessons are available to support your own mock election with your students. My students have played the game Immigration Nation a few times this week and love it. Since I am implementing Social Studies stations this year, my students rotate in teams of six and use the SmartBoard to play games as a team. They are excited to play and have worked really well in working out the scenarios that the game provides to them. This site is definitely worth checking out!